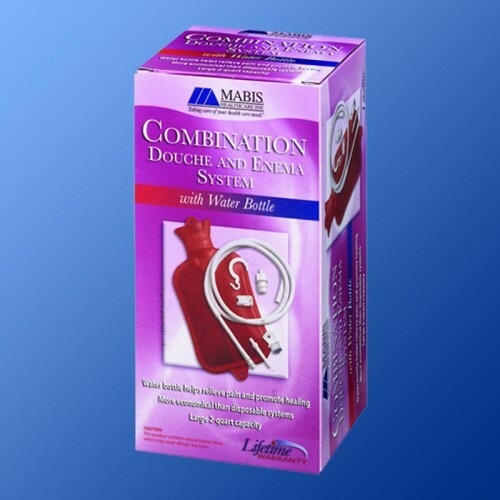 This combination douche & enema system contains a 2-quart water bottle made from durable, natural rubber latex; it is an economical choice in comparison to disposable systems. Other features of this system include: bottle hang tabs, hang hook, Shut off clap, adapter cap, 52 tubing, Enema attachment, vaginal attachment, and stopper. The Combination Douche & Enema System with 2 Quart Water Bottle includes comprehensive directions and storage instructions. Durable water bottle is good for both hot or cold therapy. Combination System includes a lifetime warranty through manufacturer. Very pleased by the order turn around time! I couldn't find this item ANYWHERE except for Vitality Medical. I'll shop again for sure! Great product, shipped and delivered promptly. product was poor quality and the hose didn't fit the male adaptor. I called and they took info. but never got back to me. I will never do business with this company again. I can't use this product for intended purpose. Horrible, defective product. HORRIBLE customer service!!! I received wonderful customer service and the delivery of my purchase was prompt! My grandmother started to use and as she said t is very easy to take an enema from this. This product is used as an enema in order to relief of constipation. It is an economical and durable product. If you have a back or shoulder ache, you may use it as water bottle for your therapy. It is also great that comes with warranty from the manufacturer.